Poll: What do you prefer to wear on a watch? What do you prefer to wear on a watch? As the subject says what do you prefer to wear on a watch? Please vote and post some photos of your preference together with your favourite watch(es). this strap is my favorite, used it every summer for 12/13 years on the aquatimer, the pictures are not mine but explain the concept. I have it also for the ecozilla. safe, comfortable, quickly adjustable, economical. Do you find the strap to keep safe with the velcro? The IWC Aquatimer is also a very cool watch! My husband has an IWC but a pilot chronograph, very nice watch. It was the one that he was wearing when we got married almost 5 years ago and that he has with him for about 11 years now. I wore that strap every summer for 12 or 13 years, the velcro never came loose. It is much faster to don than a zulu, and much faster to adjust, plus is extremely comfortable (no buckle, no retainers). As I said, I like it so much that I bought it also for my ecozilla and just ordered a third one for the autozilla. The only limitation I see is that this strap relies on the individual bars for it's safety, so I think it should be used only with screwbars (with Loctite) or with single shoulder (sometimes called shoulderless) springbars, which require drilled lugs (with thru holes I mean). That strap is really nice and a quality piece! call me old fashioned but I like leather more. For me nothing beats the smell of leather but true they can not be used underwater. What is the watch paired to the toshi strap? it's a 40mm Fortis Flieger with optional sapphire glass. maybe the watch itself is a tad small for me, but having to remove it avery time I take a shower it's just a nightmare, so I never use it. Like the Nato straps, in leather and also in ballistic nylon. I modify them cutting the part goes under the back of the watch, like old single strips watch bands. Some of my favorites; Nato, Nato leather, Leather, and Leather. I do enjoy a good bracelet now and then too, just not as often as the Nato's and leather. I do exactly the same on all my zulu straps, I hate the added thickness, and never understood the purpose of the additional webbing. Where exactly do you cut them? 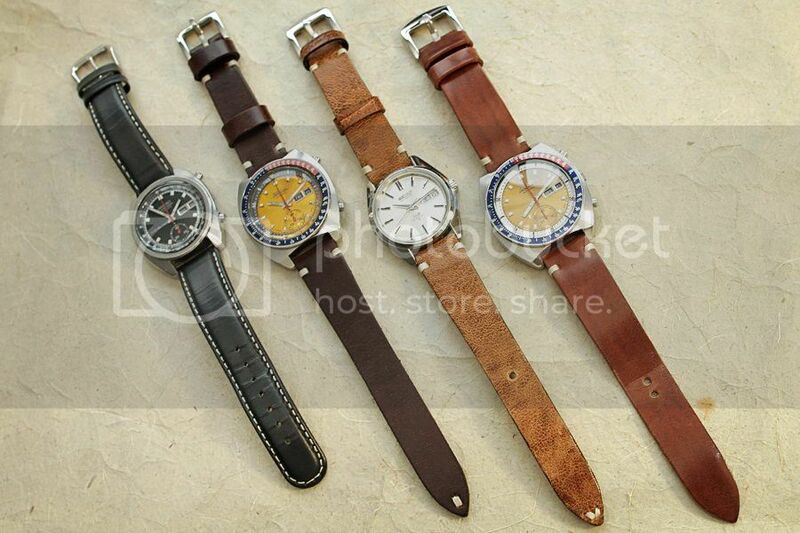 Do like either leather, stainless and nato straps... depends on the watch and the purpose of the day.